A story of a talented high school player who hopes to advance to professional baseball. A severe injury in 1957 ends his dream. With the encouragement of his coach, he earns a college degree in sports management to have a career in the sport he loves. For twenty-five years, he climbs the ladder of the minor leagues until he finally finds himself in the executive offices of the Minnesota Twins. With the untimely death of his wife, he loses interest in the job. Moving back to his small Iowa hometown, he starts a second career as the coach of the high school ball club, teaching the players about the game as well as the realities of life after baseball. 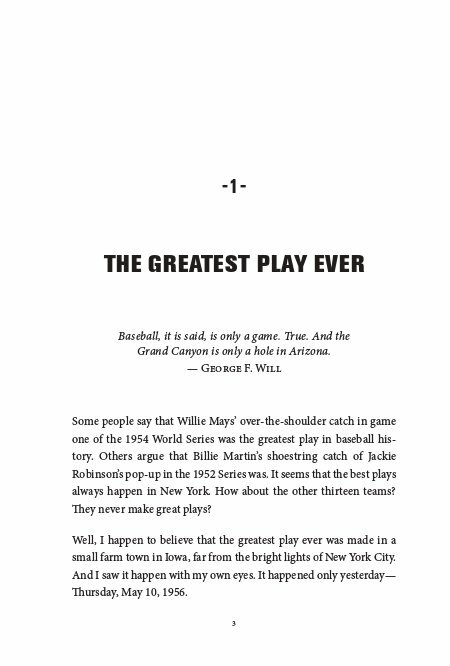 The story ends at a spring training game in 2018 with a dream blending memories of his youth with famous players, both past and present. A story about Augie Rausch's life-long love of baseball. It starts with a talented teenager playing high school baseball in a small town in Iowa in the 1950's. His post-school plans go no further than wanting a scout see him play and offer a professional contract. A severe injury in his senior year ends his career dream. With the advice and encouragement of his coach, Augie goes to college and pursues a degree in sports management. College is followed by a twenty-five-year advancement up the minor league ladder where he has held a variety of administrative positions. Not once, however, did his responsibilities take him onto the playing field as a scout or a coach. Finally, he makes it to the Major Leagues in the executive offices of the Minnesota Twins. With the untimely death of his wife Babs, he loses interest in his work, retires, and moves back to his small Iowa hometown. His love for the game of baseball remains, however, and Augie becomes the coach of the high school team. His intention as a coach is to teach the game on the field and to prepare his boys for life after their playing days are over. The story concludes many years later with Augie and his second wife Corkie in Florida watching his Twins play the 2017 World Champions Houston Astros in a spring training game. Augie has a dream that blends memories of his youth, famous players both past and present, and some of the realities he is faced with at his advanced age. George Ruszat has spent over seven decades happily observing life. He is now writing about the beauty and the absurdity of what he has experienced. And some of what he writes may have a degree of truth. George and his partner Jennifer travel, cycle, study German, and tour major league ballparks. They live in Frederick, Maryland, near the Baltimore Orioles and the Washington Nationals, but George's heart remains true to the upper Midwest and the Minnesota Twins.